This is the colour palette that I’ve been working with lately. It’s so very different than what I’d usually use or work with, and maybe that’s the reason I’m loving it so much. It’s always good to mix things up isn’t it - to push ourselves in a new direction. Maybe it’s just because seriously, look how good it all looks together.. So shimmery and lovely. I’m making tea quilts out of these pieces of my naturally dyed fabrics. The goldens and yellows were all dyed with onion skins - if you’ve never dyed with onion skins before (either red or brown onions), they’re seriously the most satisfying to dye with. So much colour, so much depth and variation with different fabrics, weights and weaves, and different processes in the dye pot. The greys are eucalyptus which was overdyed with iron. Here’s a little how-to if you wanna do this; it’s a great way to ‘fix up’ a piece that wasn’t so spectacular in the first dye pot, because sometimes that happens. 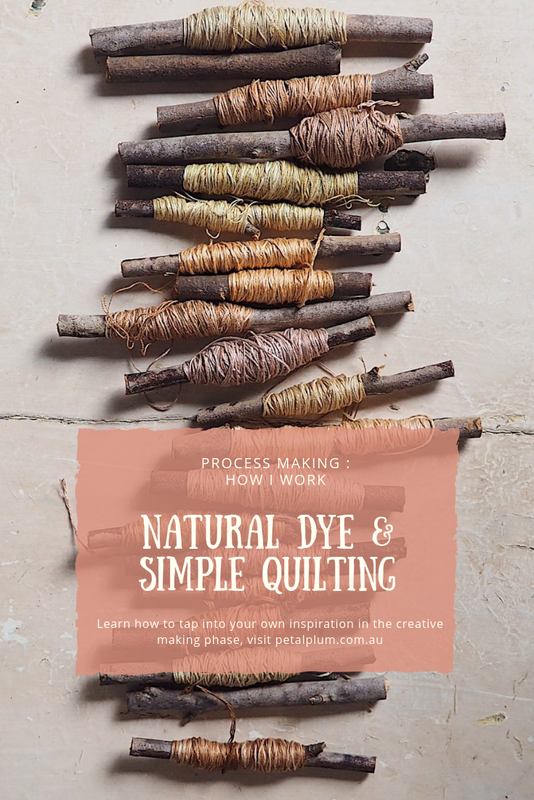 And over-dyeing is the best ways to rework a piece of naturally dyed fabric or yarn. Anyway - tea quilts. Ain’t that a sweet name. I’m not sure where I first saw it (somewhere on the vast amazing internet of inspiration - though I just did a teeny search and most images come up as quilts with tea cups on them… so mine isn’t that). These are lovely little placemats just for one person, for you to sit and enjoy your quiet moments of sipping tea. A dreamy little moment we can all hope for. Quiet tea sipping and pondering some thoughtful words. Lately I’ve been asked about my ‘process’, and sometimes it’s hard to articulate exactly what and where and how. Mostly - it comes in spurts and bursts. Keeping on trying, feeling and catching teeny glimpses of inspiration and working with that. And then pushing on without the inspiration. I feel like we have to be here ready and waiting, and working and always working, the inspiration comes and goes, but if we’re not here working then it will most probably slip on by without stopping beside us. My process is mostly based on the materials themselves, and the pockets of time that I have to work within. I am learning to not limit myself to one form or one medium or only one ‘style’. Sometimes words come out, sometimes images, sometimes simply lines and rows of stitching. The process of these pieces mostly came about by the dye pot colours. I have a vague idea of what colours or what dye stuffs (plants / flowers / etc) that I want to work with, but then I allow things to evolve. Once the colours showed themselves to me… quilt ideas started forming. The greys particularly keep talking to me and leading me somewhere further and further. A lot of my work is a journey towards the next thing. While I’m working on something, ideas are forming and evolving and becoming more articulate, easily to recognise and put into form (rather than vague images / dreams in my head). The process of making a piece guides and informs the next piece. I don’t often use a sketchbook or plan out what I’m making, because the piece becomes the sketchbook for the next piece. If that make sense at all. having materials that inspire me - natural materials, in colours of the earth & sky & ocean (ie - naturally dyed. I am being drawn more and more to the more muted hues of things lately, as a general rule - but not always, of course!). grabbing any and every moment when something sparks in me - and making it happen. Or writing little snippets of words down to guide me at a later time. being open to what evolves. Not doing a lot of self-editing while the inspiration is flowing. Just moving with it, trying to listen and hone in my own voice. when the inspiration strikes I get offline (no Instagram or Pinterest to distract me, or pull me away from my own voice), and I settle into where I am. having lots of unfinished pieces. This is ok, because these often form and spark ideas down the track. Nothing is every complete. remembering that I am ever evolving, as a person, as a creative, as an artist - and it’s ok for my work to keep evolving. and just doing the work. Keeping on doing it, showing up again & again & again.